THE USA IS NOT A COUNTRY. IT IS A CORPORATION CREATED IN ENGLAND IN 1871, AND TOTALLY UNDER NO CONSTITUTION, BUT ONLY CORPORATE AND CONTRACT LAW – – AND WE WERE NOT TOLD. 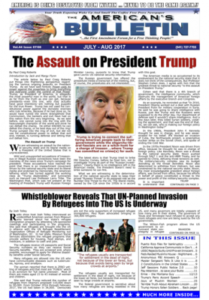 SUBSCRIBE TO THE ONLY NEWSPAPER WHERE TRUTH IS STILL SPOKEN AND GOVERNMENT SECRETS ARE UNVEILED.